The Times has also decided against partnering with Journalism Online, the start-up run by Steve Brill and former Journal publisher L. Gordon Crovitz. It has rejected entreaties by News Corp. chief digital officer Jon Miller, who is leading Rupert Murdoch’s efforts to get rival publishers onboard to demand more favorable terms from Google and other web aggregators. This fall, Miller met with Times digital chief Martin Nisenholtz, but nothing came of the talks. The decision to go paid is monumental for the Times, and culminates a yearlong debate that grew contentious, people close to the talks say. In favor of a paid model were Keller and managing editor Jill Abramson. Nisenholtz and former deputy managing editor Jon Landman, who was until recently in charge of nytimes.com, advocated for a free site. I paid before. I’d pay again. The move is a gamble for the Times, which previously tried charging for content from columnists through TimesSelect — readership fell and the project was abandoned. 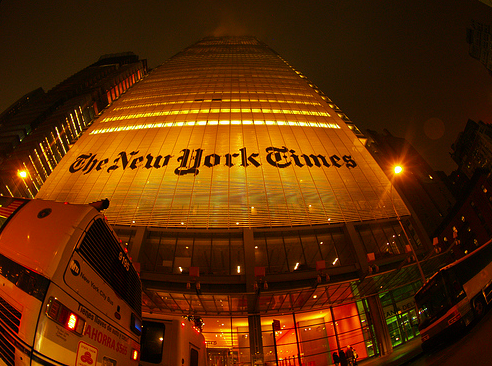 With ad revenues not meeting costs, however, the Times is taking another shot at the paid model. For me, reading on line is tied to blogging. I’m not going to spend my time reading sites that I can’t blog, and I’m not going to blog and link to sites that you can’t read without paying. Currently, I link to the NYT a lot, perhaps several times a day. I don’t know how much of their traffic is sent their way from blogs, but it’s one more factor that will limit their readership. You’d think what a newspaper would want most is readers, both to influence and to sell to advertisers. I know they need to make money, but I wish advertising was the way. Once they close themselves off — as they did once before with the failure known as TimesSelect — they sacrifice readers and lose appeal for advertisers. I know there is talk of “the metered system adopted by the Financial Times, in which readers can sample a certain number of free articles before being asked to subscribe.” If that means we can, without paying, see the front page and read a few articles (in their entirety) each day, then I might not object. That would allow me to read and feel free to blog.